Discussion in 'xLights (Nutcracker)' started by smeighan, Aug 3, 2012. I had not decided on what sequencer i would use, now i think it will be LSP (I bought it last january, just have never used it). ok, make_lsp.php is released so people can try it. 2) Right click the file that is created and store it on top of your UserPatterns.xml file. If you use patterns, make a copy first. 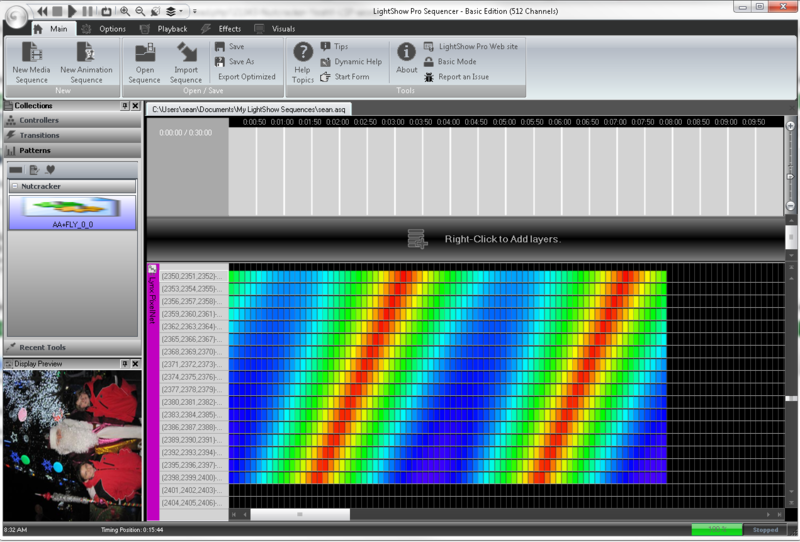 3) Launch LSP, open a sequence that has rgb channels. 5 )Drag and drop this effect onto your timeline. All of this is beta, please give me feedback. I am not sure what value i should be using for the gui id. I made a pattern and then copied the value that was from my desktop. Here follow a sample of a UserPatterns.xml file. The part in red is my question. if it turns out we need this to be custom, i will have to prompt for each of your gui values. Well done! I can't wait to try it sometime over the weekend! If this works with lsp as fluidly as nutcracker does with hls , then Lsp will be a very resourceful sequencer. Almost to the point of effects unlimited . awesome breakthrough Sean Congrats . If someone will send me a UserPAtterns.xml from 2.5 i think i can also make it work. A little more info on using the pattern. You need to wait until the pattern shows up to be able to paste it. This is like 2-3 seconds. After pasting it is another 3-6 seconds and then it is pasted on the time line. I tried a butterfly effect, 8 seconds of a 16x100 tree, each string folded in half. This is 2400 channels. Every pixel is lit on a butterfly. 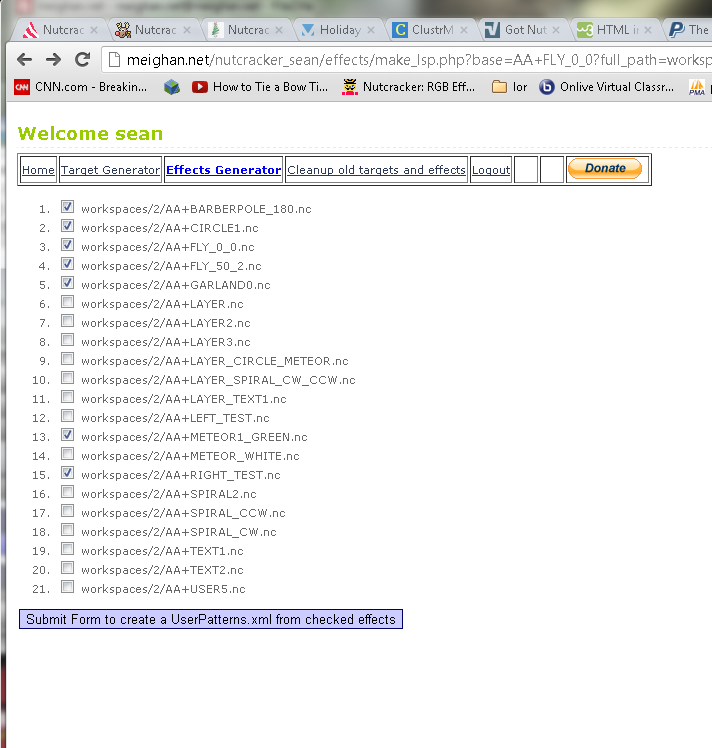 Now when you select lsp, i will first show you all of the effects that you have generated to the same target. If you are doing text on a target called MTREE, i will search for any effects you have created on MTREE. I then show you a form. select the effects you would like to be added into the Nutcracker Group inside of your UserPatterns.xml file. for my 2400 channels , each effect 8 seconds long the xml created was around 21mbytes. If i clicked all 20 effects i would be creating a 400mbyte UserPatterns.xml file. I just created 6 effects into the UserPatterns file (120mbytes) and it opened in 15 seconds. Performance seems very good from LSP in this area. I went and tried pasting multiple different effects, they all worked as expected. This release takes the nutcracker gif and converts it to a bmp. it then encodes is base64 and includes it in the xml file.